Kathy's Question: I have been married 30 years. My husband is receiving his 30 year Teamster's pension as well as Social Security Disability benefits. He receives 2 times as much as I receive at my job. Because he is collecting these pensions already are they considered assets or income and am I still entitled to 1/2 of the Teamster pension even though he is collecting it? Is it an asset or income? Timothy's Answer: The social security disability payments your husband is receiving would be considered income. The question you raised about a pension being considered income or an asset is a good one. You’ve stated that your husband is currently receiving a monthly benefit from his pension plan. This means he has a defined benefit plan, which entitles him to an annuity stream of income for the remainder of his life. This annuity stream of income should be valued as an asset when a couple is going through a divorce. When a couple is getting divorced, they need to decide how they will divide the marital estate, and this would include the current value of any pensions. There are many ways to divide a pension. One method is to compare the current pension value to the value of other assets divisible in the divorce, trading off assets until a balance is reached. In this situation, the owner of the pension would retain the monthly benefit stream of income and his or her spouse would get other marital assets which would equal the current value of the pension. Another method would be to divide the pension benefits using a Qualified Domestic Relations Order (QDRO). A QDRO is basically a legal document that spells out how pension benefits will be divided when spouses divorce, allowing the money to be distributed without the normal early withdrawal tax penalties. 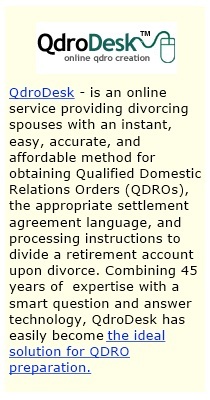 If you choose this method, it is important to have your QDRO finalized and approved prior to the divorce so your rights to collect this benefit will be protected. One more thing, state laws differ with regard to the issue of disability pay. In some instances, disability is viewed as a replacement of income and cannot be considered an asset until it is converted to a retirement benefit. In others, a disability benefit is considered property. We do not engage in the practice of law and therefore recommend you consult an attorney on all legal matters. Copyright WomansDivorce.com. Do not copy. As a certified divorce financial analyst, Timothy McNamara specializes in helping individuals and couples work through the financial issues that arise when their marriage ends. Having gone through his own divorce, he understands the challenges people face and helps them manage complicated financial issues to be able to make the best decisions.